Performers include: Meghan Ory, Jesse Metcalfe, Treat Williams, Diane Ladd, Laci J. Mailey, Emilie Ullerup, and Barbara Niven. A multi-generational family drama, this series follows a high-powered career woman, divorcee and mother of twin daughters. She makes a trip from New York City to her hometown and comes face to face with her past. It may finally be time for her to mend her fences with her family and put the past to rest. At the same time, she may get a chance to revive her long-lost true love. A beautiful young woman of Irish-American extraction, Abby O’Brien (Meghan Ory) is the divorced mother of young daughters Carrie and Caitlyn. The product of a broken home, she left Chesapeake Shores at an early age and started the uphill climb and achieved great success. Now one of the top financial analysts in a prestigious investment firm, Abby returns home for a weekend visit to help out her scatter-brained younger sister. Energetic Jess (Laci J. Mailey) has purchased a dilapidated old inn and intends to transform it into a bed and breakfast but needs to call on Abby to save her from early bankruptcy. Once back home, however, Abby begins to assess her situation afresh. Although her city life seems perfect, Abby is intensely unhappy and is tired of the rat-race. Abby begins to realize that her future may not lie in Manhattan, but in a slower and more family-friendly field office nearer to the Shores. Abby’s meeting with her old love, musician Trace Riley (Jesse Metcalfe), complicates her emotions considerably. However, she left town suddenly years ago and he hasn’t forgiven her for it. Abby also has a still-fractious relationship with her stubborn and workaholic father, Mick (Treat Williams). Mick’s wife, Megan (Barbara Niven), left him years ago — when Abby was 17 years old. Mick raised his three girls as a single dad, with the help of his strong mother, Nell O’Brien (Diane Ladd). Still very loving today, she bonds with Abby’s twins. Abby’s younger sister, Bree O’Brien (Emilie Ullerup), is a struggling and neurotic playwright. She returns home to help take care of her ailing grandmother and has hopes of finally overcome her writer’s block. What do you think? 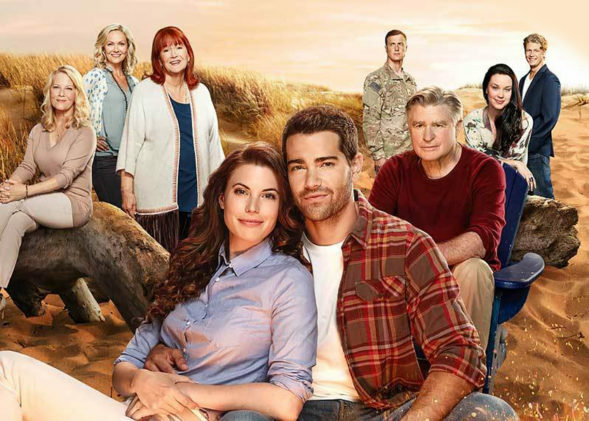 Do you like the Chesapeake Shores TV show? Do you think it should be cancelled or renewed for another season? Chesapeake Shores is an awesome show. I really enjoy keeping up with the O’Brien family. I am really hoping this TV show will be renewed for a 4th season. I loved this show, and binge watched all the available seasons. Can’t wait for it to return. This a great family show. We need more shows like this. I have watch the first 2 series but have not yet got the Series 3 for 2018. I watch Hallmark on Hulu and also will be glad when it goes live on my outside antana. Why can I not get series 3? I absolutely love Chesapeake Shores. The cast is very talented and a terrific mess of characters. Treat Williams and Diane Ladd are wonderful actors. I wish it started up sooner than August. Good job Hallmark Channel for a clean, family friendly entertaining series. I love Chesapeake Shores and was really excited for Season 3, only to find out we can’t access it with our service provided Bell Canada. Very disappointed to fine this out today, Bell does not carry the Hallmark Channel, woold love to know if theres another way in which to view this series.. It is on Super Channel in Canada. I have Bravo, Showcase and W and it is not showing yet. No adds have appear on those channel. I think this show should continue. I like family dramas and this is a good one.